We have some special girls clubs and every week we have one association period where we interact with juniors and seniors and develop our skills Nation level fest LAKSHYA is held every year. There are two hostels separate for boys and girls Fee for girls is INR 56000 and boys is INR 62000 It doesn't cost much for PGs outside INR 30 per meal and it's not good Classrooms are not that good, labs, library facilities are excellent. we do internships in 3rd year of btech but we did not get any stipend .TCS, HCL, TECH MAHINDRA, AMAZON INR 600000 is the highest package pass percentage of cse is 82 and ece civil are 98.5 approx. alumni its good they work well. After completing intermediate in PCM stream and admission process was based on the rank obtained (80/160 is minimum) in EAMCET exam. There are separate hostels for boys and girls at Lakireddy Bali Reddy College of Engineering. The average salary package is INR 35000 per month. 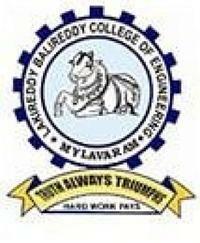 The eligibility criteria to get into Lakireddy Bali Reddy College of Engineering is to qualify EAMCET examination. There are many feasts conducted at Lakireddy Bali Reddy College of Engineering like college feast, department feast and annual days, freshers party and a farewell party. Lakireddy Bali Reddy College of Engineering consists of the biggest administrative block know as white house in the entire state of AP. I haven't done my internship yet. As for campus placements, Lakireddy Bali Reddy College of Engineering attracts well-reputed companies like TCS, tech mahindra etc. Lakireddy Bali Reddy College of Engineering is a good college with great study and a friendly atmosphere consisting of a central library which is very useful. The are no clubs and associations in my college. Overall the college is bad. The administrative block looks exactly like the White House. The daily routine is too much as its hectic without any holidays. The quality of teaching is bad as only class learning is implemented which is not productive at all. The faculty is too poor as they need to improve a lot in that. The fees for all the courses are reasonable. There weren't any good companies to work as an intern. The placements in the key companies are just average. Student societies, clubs and associations on campus are good. Annual day and technical fest are the main festivals on campus. The life in the college is friendly at LBRCE. 3 hostels are there in our college. Rs 50000 is the hostel fee for our college. Food is college is good and it costs Rs 50 at LBRCE. Assignments and daily routines are good. The quality and method of teaching are excellent. The overall experience is wonderful at LBRCE. Rs 80 thousand is the course fee per year at LBRCE. 100 students get a scholarship for each class. About the internship, I have not done yet. TCS and Polaris are the key companies visiting LBRCE. Rs 2 lakhs per annum is the average salary figure. Rs 5 lakhs per annum is the highest salary figure. AP EAMCET rank is the eligibility criteria for our course. AP EAMCET entrance examination is required to get into LBRCE. 40 is the typical cutoff. We have CSI ITI memberships as we are CSE students .the cultures are very good in our college . There are 2 hostels one for boys and another for girls the hostels are provided with neat infrastructure and also WiFi facilities . No internship till now. TCS is the major company which recruits the students from our college .almost TCS offers 3.2 lakh per annum that's the highest package to our college and many of our senior students have been placed in the well reuputed companies .I don't have a brief idea about alumini network . The entrance exam for this college AP EAMCET. My class timing starts at 9:00 am and daily assignments are provided and quiz also Quality is good for some subjects Learnable ,motivational and trainable. The eligibility criteria are Completion of +2 to a procedure of our course. The entrance examination is Eamcet . There are few student societies in college. Tech and sports are the main festivals in my college. Studies and friends are my life in college. There are 2 hostels in my college hostel fee is Rs.5000 per month. Food in college is very good and it's cost is Rs.30/- per month. The infrastructure of my college very nice. Daily routine is very good. Quality and method of teaching is good. Experience in college is very nice. My course fee is Rs.50000 per year. The fee structure is given to students. I don't stipend any internship . The average salary for the year depends on company rule. It's good to network.